The Supreme Court (SC) on Thursday allowed Delhi Police to arrest forthwith Anil Sharma, the chairman and managing director (CMD) of Amrapali Group, and two directors of his company — Shiv Priya and Ajay Kumar — in connection with an Economic Offences Wing (EOW) case. The EOW of Delhi Police has registered a case against Sharma and two of his directors for allegedly diverting homeowners’ money and cheating them by not delivering on the projects despite timely payments. “Let the police investigate the entire gamut of the scenario of the various projects as projected in this case and various orders passed and in­vestigate the entire matter. Prima facie, we find that the case requires serious investigation in the facts projected by the directors, chief financial officer (CFO) and the statutory auditors,” a two-judge bench of Justice Arun Mishra and Justice U U Lalit said. The court is hearing a batch of petitions filed by about 42,000 homebuyers of the Amrapali Group projects, who have not received possession of their homes despite having paid for it. On Thursday, the bench also ordered attachment of personal properties of CMD Sharma and the two directors. Apart from Sharma, the court also allowed Delhi police to probe the role of the statutory auditor of the company Anil Mittal, CFO Chander Wadhwa as well. With the arrest of Sharma and the two directors, homebuyers are hopeful that the top court would now allow NBCC (India) to start construction on the long-pending projects of the Amrapali Group. “We have been demanding (the arrest) for a very long time as the criminality and fraud committed by them towards the buyers has to be unearthed by police. We are hopeful that on the next date, the court will finally direct NBCC to start construction,” the lawyer for homebuyers, Kumar Mihir said. During the last hearing on February 14, the top court had grilled CMD Sharma and warned that he would be sent to jail for his “reluctance” in disclosing the identity of a person who had bought company’s shares worth Rs 140 crore from the multinational firm JP Morgan. Earlier in January, the apex court had appointed a forensic auditor to inspect the books of the construction company along with all the pending projects. 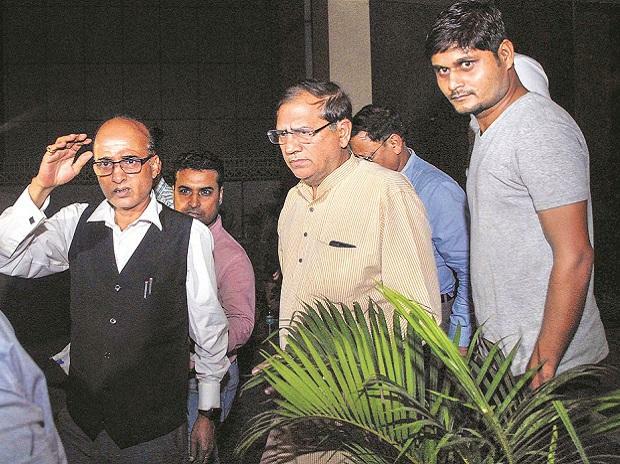 The forensic auditor had, during the hearing on February 14, told the court that houses in Amrapali projects had been booked for as low as Rs 1, Rs 11 and Rs 12 per sq ft. The auditor had also informed the court that as much as Rs 6,000 crore could be raised by selling the 5,229 unsold flats. The auditor has been asked to complete the audit of the group by March 22. On February 11, the apex court had taken strong exception to two prime properties of Amra­pali, including a five-star hotel, finding no bidders in an auction and said that prima facie it lo­oked like “cartelisation is at work”. The top court said it was “shocking and disturbing” that bankers were not coming forward to finance the properties. A five-star hotel Amrapali Holiday Inn Tech Park constructed in Greater Noida and prime land at Vrindavan in Uttar Pradesh were put up for auction on January 31 by the Debt Recovery Tribunal but no bidder had come forward to bid.